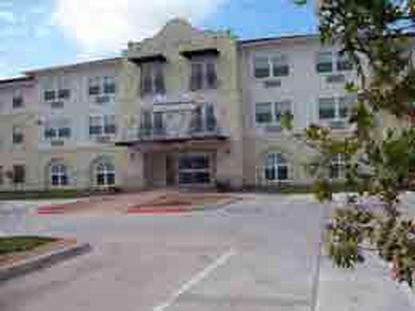 Bexton Place Apartments, located at 131 Darson Marie Drive in San Antonio, has one bedroom apartments. Bexton Place Apartments participates in the Section 202 Supportive Housing for the Elderly program. Currently Bexton Place has a waiting list. Please call for the approximate waiting time. Bexton Place is a three-story apartment community specifically designed for older adults who are at least 62 years of age. There are 54 one-bedroom units, four of which are handicapped accessible units designed to benefit the mobility, hearing or visually impaired. The community is ideally located within a lovely, partially wooded residential area and in close proximity to restaurants, retail business, churches, medical and dental offices, and public transportation. Bexton Place features a community room with a kitchen to be used by the residents for a variety of social, educational, and recreational activities. The entry lobby and library area provides a friendly environment for the residents to socialize. There is a computer room set up for the residents to use. There is also a laundry room equipped with coin-operated washers and dryers to allow residents to do their laundry on site. A crafts room is also available for residents to work on projects. The management offices are located on site for convenient communication for the residents. There are supportive maintenance areas dedicated to the continued maintenance and operation of the community. There are trash collection rooms/chutes on each floor. The community is securely maintained with a “key fob” front entry system for the residents and an intercom system for the residents’ guests and family. Each resident’s unit is accessed through interior corridors. The typical unit design provides for one bedroom, a kitchen (with a counter, refrigerator, range, and vent), a living room/dining room area and a full bathroom. The mobility impaired, accessible units have roll-in showers for ease of access for those residents in wheel chairs. They also have appropriate appliances, counters and sinks, and turning radius to meet the special needs of the mobility impaired. Bexton Place is a smoke-free community. These general income qualifications for San Antonio, Texas should only be used as a basic guide. To find out if you qualify, contact the community directly. Bexton Place Apartments receives rental subsidies through HUD-Assisted Housing for some or all of its apartments. Some units may be designated as market rate housing. Market rate units would have no subsidies or income restrictions. Bexton Place Apartments is managed by Retirement Housing Foundation.